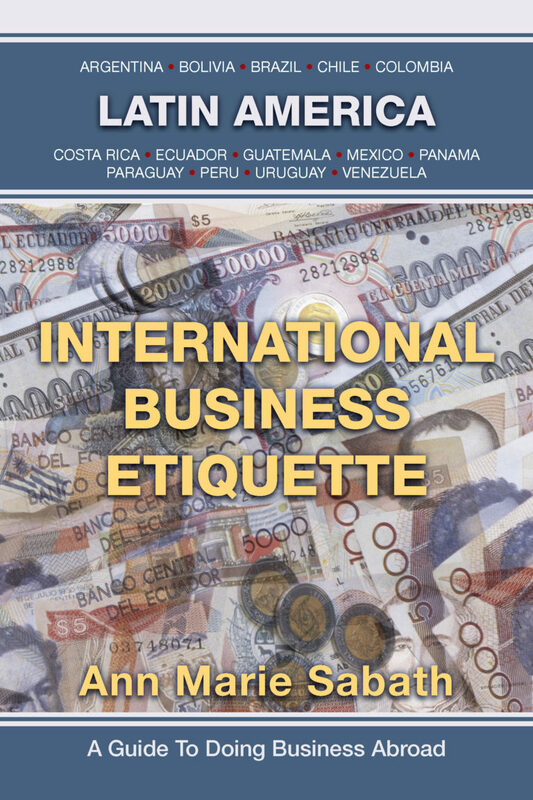 International Business Etiquette: Latin America shares the do's and don’ts of interacting with individuals in all the major commercial countries of Latin America. Each chapter is devoted to a specific country and begins with a summary of statistics. What follows are countless tips about what to do and when to do it, whether you are interacting with your international client for the first time or the tenth time. Each chapter closes with tips for avoiding the most commonly-made country-specific faux pas. Ann Marie Sabath concisely answers the questions everyone has about the most effective ways to conduct business in Latin America. For readers requiring more help, the author makes available her bilingual toll-free telephone and e-mail help lines. Greetings and introductions play an important role in Brazilian business relationships. You can expect your initial introductions to be warm, loud and exciting occasions. How you greet your Brazilian counterparts in return will play an important part in developing first impressions and continuing relationships. Be sure to shake hands with everyone present, both when arriving and departing from an event. If you know the rank of your Brazilian colleagues, attempt to acknowledge them by rank from highest to lowest. Expect a warm and extended handshake; physical touching is also the norm (shoulder patting, kissing, hugging, etc.). Avoid restraining or tightening up if you are offered one of these affectionate gestures; to do so may be perceived as an insult. Not that as the relationship with your Brazilin counterparts grows, the level of affection will also increase. Always maintain good, steady eye contact when shaking hands and when making small talk. Women typically kiss on both cheeks when meeting and departing. If a woman is married she receives two kisses, one on each cheek. If the woman is single however, she received a total of three kisses (for example, left cheek, right cheek, left cheek). Recognition and status are important in Brazil; therefore titles should be use the surnames whenever appropriate - - i.e., Doctor Santiago, President García, Executive Sánchez. However, be aware that some individuals may introduce themselves by using their title with their first name, and may, in fact, prefer to be addressed this way. If an individual does not have a title, he or she may be addressed by using pleasantries such as Mr. (Señor) or Mrs. (Señora) followed by the person’s surname. It is always a good idea to ask people how they prefer to be addressed. In Brazil, individuals usually have two surnames. When written, the mother’s surname comes before the father’s surname – for example, Juan Valdez Mantilla. It is appropriate, however, to address people using their father’s surname – for example, Señor Mantilla. When a woman marries, she usually takes her husband’s surname. For business purposes, however, it is common for women to use their father’s surname. In Brazil, people quickly move to a first name basis. However, never refer to an individual using his or her first name until invited to do so.